Vintage MG Parts commission high quality foundry casting work and the quality of the aluminium finish lends itself to absolute precision machining of the dashpot assembly, whereby a 2 thou clearance in the finish provides for perfect carburettor action between dashpot and damper. 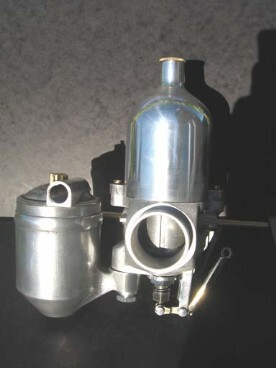 This is supplied with a variable as opposed to a fixed jet assembly. Our carburettors have a circular flange which compliments the flange on our Volumex 'staggered back' carburettor manifold. We are only making these available to our customers as part of the purchase of our full Volumex supercharger kits which are usually in stock.